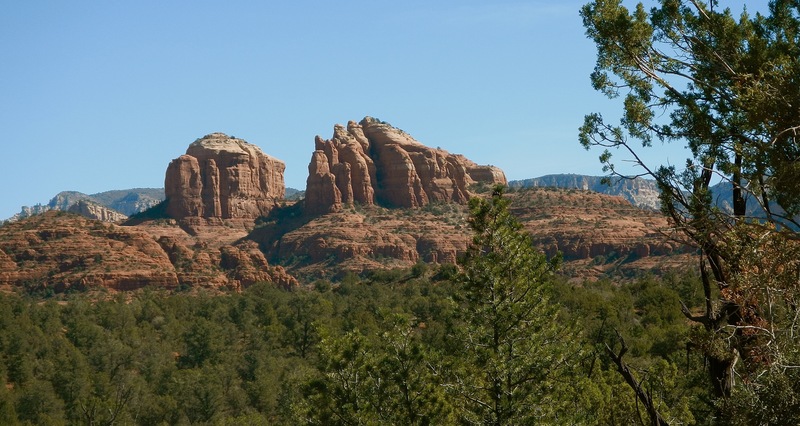 Sedona is located at the base of the Mogollon Rim, an escarpment that runs east/west through the middle of Arizona. The Rim, which is about 200 miles long, ranges between 2,000 and 3,000 feet in height. As the landscape was eroded at the end of the Flood, it left behind spectacular and picturesque canyons and buttes. Sedona, overlooking some of these canyons, is known for its beautiful views, so come and enjoy them with Fellowship Adventures. We're looking forward to seeing you at Red Rock State Park. Groups will start hiking at 9:00 AM and everyone should be done by 1:00 PM. Please plan to be at the registration tables by 8:30 AM so you can be assigned to your group and we can start hiking on time. Please review the Things to Know information. For your first hike with us, we highly recommend registering for one level below the level you think fits your ability. Also, please remember to eat before you come so you will have the energy to hike. Head north on I-17 to exit 287. Take AZ 260 W toward AZ 89A/Cottonwood. Turn left onto AZ 260 W. Continue to follow AZ 260 W for approx 12 miles. Turn right onto AZ 89A N for 13 miles. Turn right onto Red Rock Loop Rd. After 3 miles, turn right into the park. Look for Fellowship Adventures signs. To get directions from Calvary Community Church, click here. There is plenty of parking in the immediate event staging area, but we encourage carpooling. You can sign up for carpooling during the registration process. For details on how carpooling works, see the Carpooling section of the "Things to Know" page. Carpools will meet at Calvary central campus (west side by the mailboxes) – last carpool leaves at 6:30 AM. This hike will include 4 levels of hiking. You will sign up for a level when registering. The levels are listed below, or see levels of difficulty for more details. Roadrunners – For the serious, go-fast hiker who desires the challenge of speed and distance (7 to 10 miles) and prefers to race past the sagebrush rather than smell it! Coyotes – For the recreational hiker who desires energetic physical activity (4 to 7 miles) and the opportunity to stop and smell the sagebrush. Prairie Dogs – For the casual hiker and families who want to get some exercise (about 3 miles) but will stop to enjoy the view and rest as they hike. Geckos – For the person or family new to hiking or just coming back from a long time away. They will do about 2 miles of relatively flat trail. Children are more than welcome to join this event, but please read the Children section of the "Things to Know" page before you come. * If you are bringing a child under the age of 18 for whom you are not the parent or legal guardian, a Medical Waiver/Consent Form must be completed, signed by a parent or legal guardian and presented at the check-in prior to the event. Dogs are welcome on all except the Roadrunner hike. Remember to consider the heat before bringing Fido and please read the Dogs section of the "Things to Know" page. One way to connect with other Fellowship Adventures participants is through the Fellowship Adventures Facebook page. You can sign up for our mailing list here to receive early notices of upcoming events.